I was diagnosed with type-1 diabetes nearly ten years ago, on my honeymoon in Barcelona. If you Google the phrase “Honeymoon Horror Story”, my essay about the prelude to this diagnosis (I was hit by a car) appears on the first page results. I’m perversely proud of this fact. But really, I do not remember my honeymoon as a “horror story." My diagnosis saved my life and set my path. With daily insulin injections, I recovered my health and transformed my lifestyle. Since my diagnosis, I’ve performed a rigorous daily experiment upon myself: each day, I’ve tested my body’s response to the sugars in foods (up to 12 times a day), and I’ve calibrated my insulin needs and lifestyle to best suit optimal health. I believe my experience might prove instructive for others--especially as we enter the holiday season with its promise of cookies and candy and cakes. 1. Sugar (in most forms) is not necessarily unhealthy. We all need sugar to thrive. Glucose, specifically, is the optimal form of energy for the human body. Every cell, every bacterium uses glucose for energy. The trouble begins when we consume more sugar than our bodies need. If you received your sugar (fructose) only from vegetables and fruits, you’d consume about 15 grams per day—a far cry from most diets. "The brain uses about 120 grams of glucose daily: 60-70% of the total body glucose metabolism. The brain has little stored glucose, and no other energy stores. Brain function begins to become seriously affected when glucose levels fall below ~40 mg/dL." There is much debate about this requirement, but for our purposes, using 120 grams as a baseline for 70% of the body’s needs, we see an estimate of 174 grams of sugar per day. This can come in the form of carbohydrates, which are converted to sugar (my favorite bread recommendation provides 17 grams of sugar per slice) or the pure sugar found in juice or soda (a 12 oz. Coke Class provides 39 grams of sugar). 3. Sugars exist in apparently healthy foods: Apples. Brown rice. Sweet potatoes. All carbohydrate foods are eventually metabolized as sugar. From a limited perspective, the sugar you receive from a bowl of grapes might be more than the sugar you receive from a Coke Classic. Of course, in vegetables and fruits, sugar is mixed with fiber and beneficial phytonutrients, which can potentially moderate any negative metabolic effects. The best way to consume sugar, of course, is to eat vegetables--like the winter squash dish below. In any case, it isn’t that sugar itself is bad -- it’s excessive sugar that harms health. 4. Sugar that is not used is stored for later use. Any meal or snack with carbohydrates generates a rise in blood glucose. To adjust for this rise, the pancreas secretes the hormone insulin into the bloodstream, which lowers blood glucose levels. Insulin is essentially a storage hormone, evolved over millions of years, to store the excess calories from carbohydrates in the form of fat. 5. If you don’t use it you gain it: The upshot? Not matter what type of carbohydrate or sugar you eat, if you do not match your sugar requirements with your sugar consumption, you will likely gain weight. With this in mind, I think it’s important to remember that sugar can exert a powerful and potentially positive emotional effect. So how can we modulate our holiday sugar consumption so that we can enjoy our favorites while still enjoying our health? 1. Exercise, Exercise, Exercise: To my point of view, there is no better way to truly enjoy a potentially sugar-heavy dish (like"perfect" mashed potatoes) than to truly earn it through exercise. When you exercise (especially intensely) your muscles become more efficient at absorbing sugar for a period of 24 hours or more. 2. Enjoy every bite! If you’re eating sugar this holiday season, make sure you enjoy each and every bite. Try to be conscientious about what and how you’re eating. All cookies are not created equal. And all eating experiences are not created equal. Save yourself for the best cookie and enjoy it with the appreciation and gusto it deserves. 3. Eat the real deal: More and more evidence now reveals that sugar is actually less harmful than sugar alternatives. This recipe is adapted from the Cook's Illustrated mashed potatoes in The New Best Recipe. The recipe calls for peeling the potatoes by hand, but a ricer works wonderfully, producing the most light, airy potatoes imaginable. Place the potatoes whole in a large saucepan with water to cover. Bring to a boil, reduce heat to medium and simmer until the potatoes are tender, 35-45 minutes. Drain. Reserve pot for mashing. Meanwhile, warm the coconut milk in a medium saucepan over low heat. Season the coconut milk with sea salt, and black pepper to taste. While still warm, cut each potato in half, then peel the skin with fingers or a small paring knife. (Alternately, and much better, place the potatoes, skin-on, into a ricer or food mill.) Drop the peeled potatoes back into the pot you used for boiling. Gently mash the potatoes with a potato masher. Add butter and mix. Add the warmed coconut milk, and gently season with additional salt and pepper, adjusting seasonings to taste. Serve. I always get depressed in December because squash season is almost over. So I grasp at the last of season and try to make something immaculate. I originally developed this recipe for Whole Foods Market. It's published here. Meanwhile, put pine nuts into a food processor and pulse until coarsely ground. Stir in thyme, remaining 1/2 teaspoon sage and 1/4 teaspoon salt. Set aside. When acorn squash is cooked, remove from oven. Reduce heat to 300°F. Carefully turn squash over and fill each cavity with about 1/2 cup of the risotto. 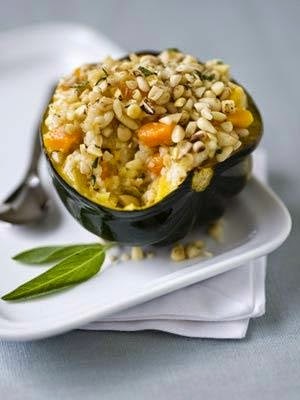 Gently press about 2 tablespoons of the pine nut mixture on top of the risotto in each squash half. Return squash to oven and bake until topping begins to brown, about 20 minutes. Transfer to plates and serve.